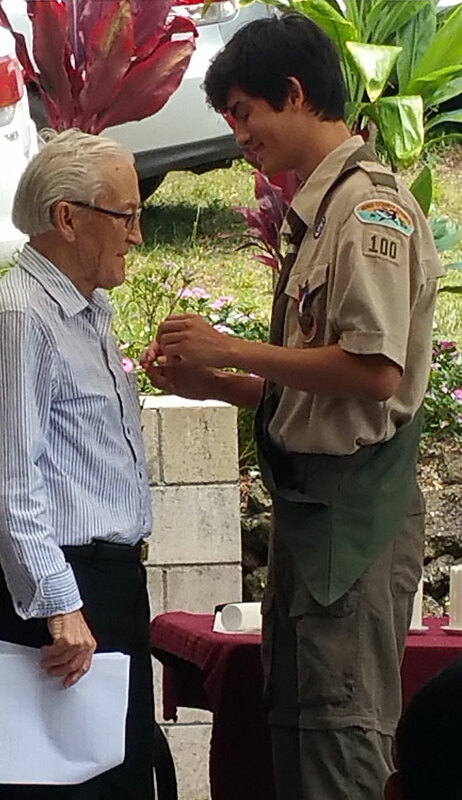 Ulupalakua- Aolama Chow of Boy Scout Troop 100 in Kula completed his Eagle project at the D.T. Fleming Arboretum at Pu’u Mahoe to earn the Boy Scouts of America’s highest honor – the Eagle Scout Award. The Award ceremony was held at the Arboretum on Saturday August 12. Aolama coordinated a 3 day campout April 7 to 9 with Scouts from Troop 100 to accomplish his Eagle project- the construction of 20 steps connecting 2 trails in the Fleming Arboretum, accessing a new area for native plant expansion. Project supplies were funded by Kaulunani Department of Forestry and the Maui County OED Environmental Department. Eucalyptus steps were supplied by South Pacific Lumber of Ulupalakua. Ulupalakua Ranch supplied additional parking for the celebration. David Moran was Aolama’s project mentor to teach him the details of building steps and oversee the project. Aolama taught his crew of 35 volunteers, Scouts of Troop 100, to build steps with proper rise, depth, and width, and the importance of soil compaction. Extra volunteers planted 30 feet of Ti leaves along trail at base of new steps and broadcast grass seed to control erosion. The DT Fleming Arboretum at Pu’u Mahoe is a 17 acre cinder cone planted in 1952 as a plant recovery reserve and seed resource for native forest restoration. Today the Arboretum protects 170 native plant species, 40 of them Endangered, 14 designated Maui County Exceptional Trees. The Arboretum is an education and conservation resource promoting youth and community group involvement in the preservation of Hawaii’s native plants, forests and wildlife habitat. 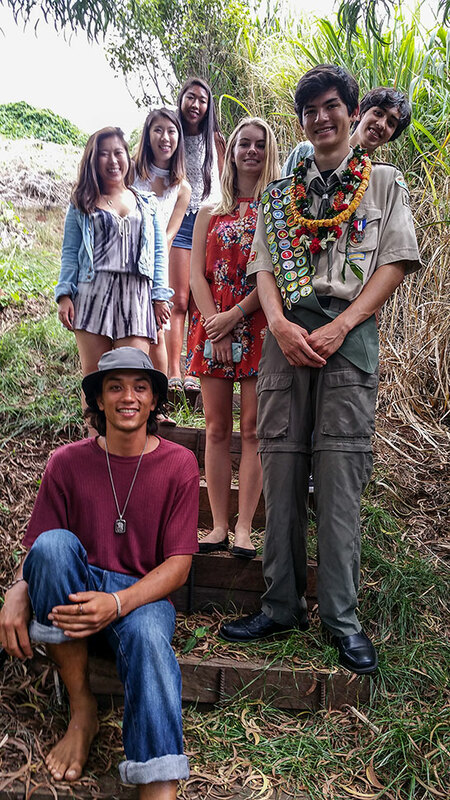 “With the importance of Pu’u Mahoe & the Fleming Arboretum is the importance of Aolama’s Eagle Project” stated David Moran, Arboretum Project Manager. Aolama Chow, the son of Clifford & Nara Chow of Kula, graduated this year from Kihei Charter School and will be attending Seattle University in September.